The idea of a Tardis-like space, where the internal volume is greater than its physical boundaries, had always appealed to me. That was how the idea for 20:50 came about. I've always been concerned with the ways you can change architectural space - whether it be a room or a whole building - to alter your perception, to knock your view of the world off-kilter. The central idea finally came to me after weeks beside a swimming pool, during a holiday in the Algarve. I was due to make a new piece for Matt's Gallery in the east end of London when I returned, and over the weeks I became increasingly fascinated with the horizontal surface of the pool. One day it hit me, and I thought: "I know - I'll flood the place." The oil became part of the piece because I knew it had a highly reflective surface. There had been a drum of the stuff sitting in my old studio, without a lid, that I'd been meaning to get rid of. In the meantime, all sorts of rubbish had accumulated around it, and I always loved the way that among all these bits of junk there was this void, this perfect reflection. That was the final piece of the jigsaw. 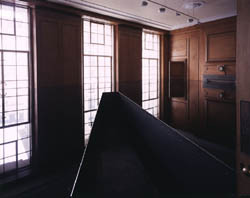 In 20:50, the gallery is filled to waist height with recycled engine oil, from which the piece takes its name. 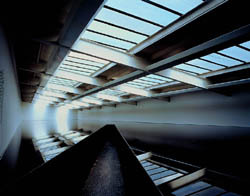 A walkway leads from a single entrance, leading the viewer into the space until they are surrounded by oil on all sides. Which art school did you attend? I went to the London College of Printing for a Foundation Course to study Graphic Design and of course the idea was to go on and become a graphic designer, but half way through the Foundation Course I became frustrated that I wasn't using my fingers. I realised that I was actually a maker so I applied and got into what was Hornsea College of Art in 1971 and was there until 1974 with artists like Daryl Viner. I was awarded a First Degree Honors in Sculpture, DipAD, which supposedly later you could pay 10 to have it transferred over to a BA, I never did that. But I did go on to Reading University, I applied to do a Post Graduate Course and did what was called an MFA, a Master of Fine Art at Reading from 74 to 76. When did you first move to where you are now in london? I first moved back from Reading ( although at the very last term at the University I was already travelling back to London and came across the Butlers Wharf comnplex which was this enormous, sort of organically built complex of artists. I remember going to Space organisation and them saying when I queried Butlers Wharf not to touch it it was very dodgy, meaning there is no actual organised structure to it. People arrive in London and sort of go and find an old warehouse and that was the easiest one to get into) to Butlers Wharf in 1976 into Block W11. I was there until 1981. Having completed the MFA at Reading University I knew I wanted to make a career as a sculptor and at that time my idea was to establish a studio. There was very little thought about living there as well but it became obvious that a living and working space was available at Butlers Wharf, and this seemed to answer the requirements for me as an artist. I was moving back to London, I needed somewhere to live, I needed somewhere to work, so that space that I got hold of gave me that and it just made the process of being a sculptor at that time much, much easier, being in that kind of complex.